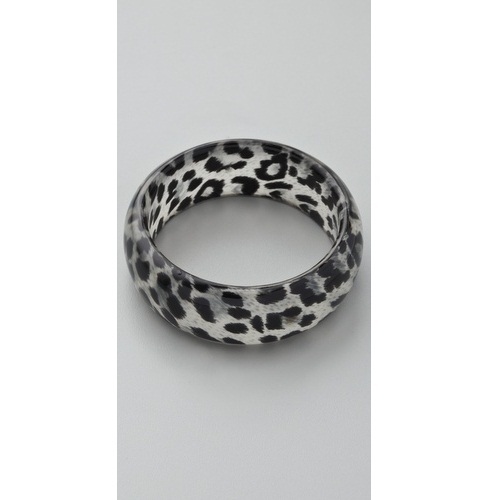 This semi-transparent resin bangle features a snow Leopard print. * 2.5″ (6.5 cm) diameter. * 1.25″ (3 cm) wide. In a word, Kenneth Jay Lane’s jewelry is glamorous. Each piece is innovative and imaginative, consistently proving that costume jewelry can be as beautiful as the real thing. “Elegance, luxury, and good taste never go out of style,” says the Michigan-born designer who creates each style with the everyday woman in mind. Accessible yet enchanting, Kenneth Jay Lane’s impressive collections have caught the eyes of such classic beauties as Jackie Onassis, Audrey Hepburn, Sarah Jessica Parker, and Nicole Kidman.